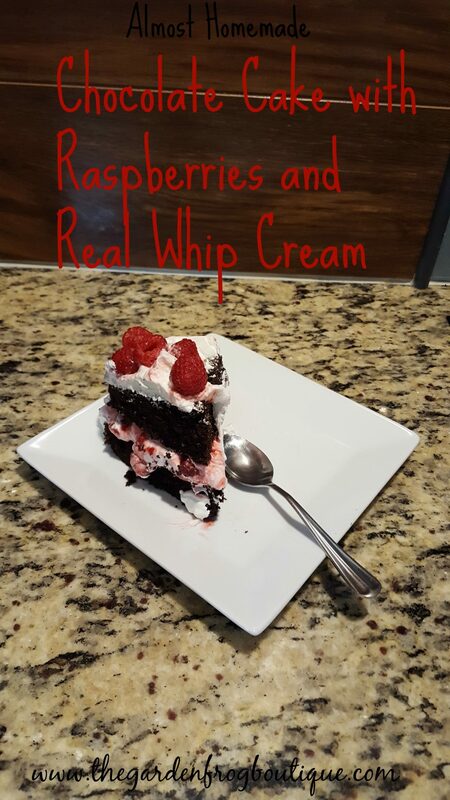 Almost Homemade Chocolate Cake with Real Whip Cream and Raspberries came to be a few years back when I decided to try using real whip cream instead of frosting for a cake. I also had some frozen raspberries in the freezer so a ‘light bulb’ went on and I really do not like ‘canned’ frosting so I wanted something different. Sometimes frosting gets old and when you have a family that loves sweets, you get to experiment and see what happens. I say ‘almost homemade’ because the secret to my baking is butter. Not the fake stuff. Not oil. 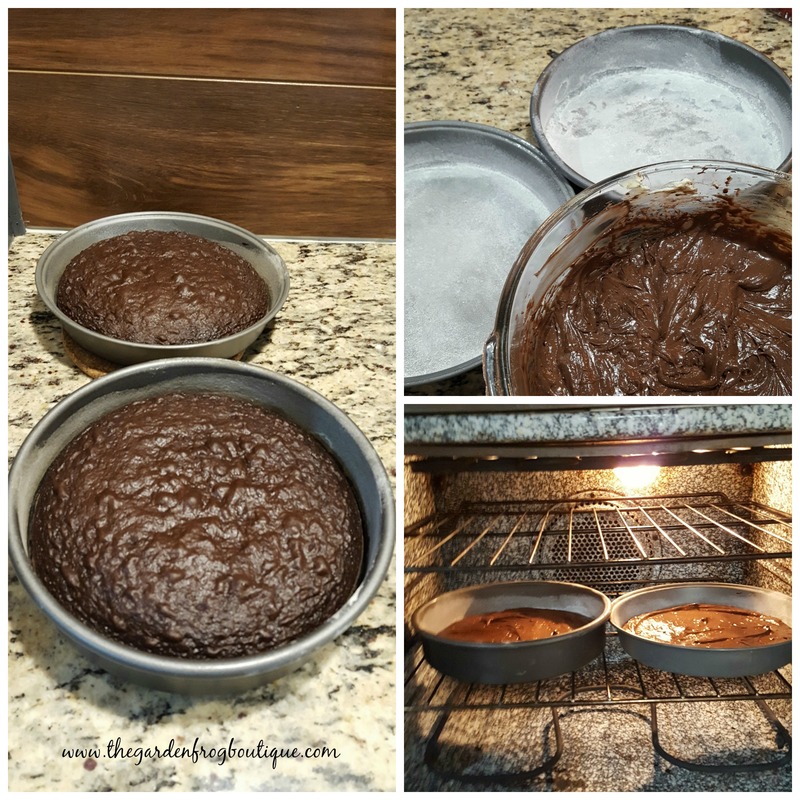 I like using butter and find that brownies, cakes, and even dishes just taste better. Now I didn’t use butter until about 25 years ago when I realized that margarine and oil are not good for you. This is a simple recipe with nothing fancy but the family loves it. I do want to throw in a hint about baking times- I set the time for a couple minutes under the baking time stated on the box and I lightly push in on the cake to see if it bounces back. I take the cake out when the top bounces back. Let cool for about 15 minutes (or to touch) and flip out of pans to cool longer. At this time whip your cream and stir the raspberries that have been thawing in the bowl. 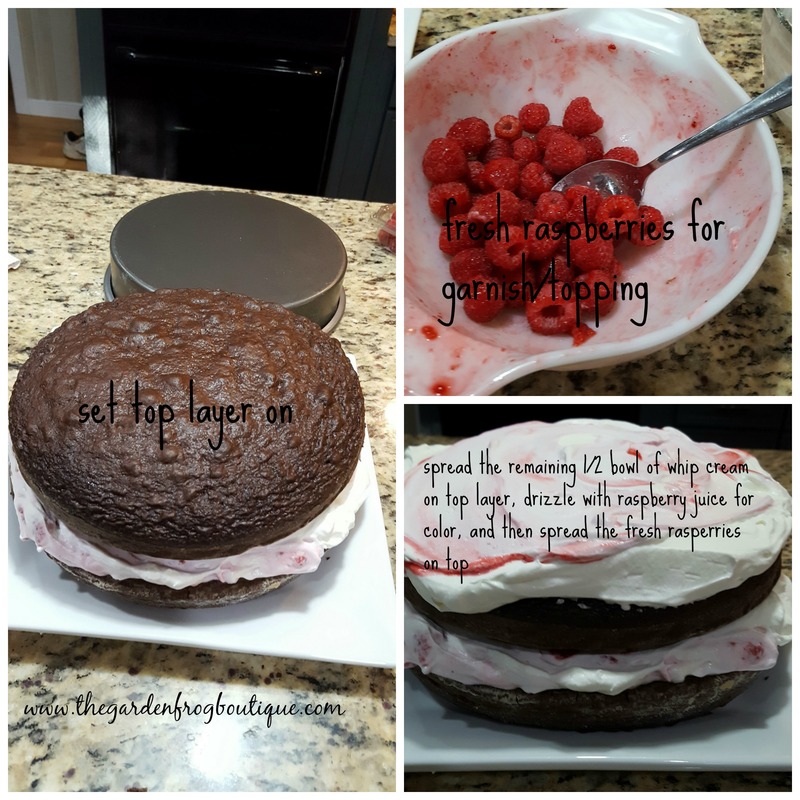 If the cakes are not cool, then place whip cream in refrigerator for a few minutes. 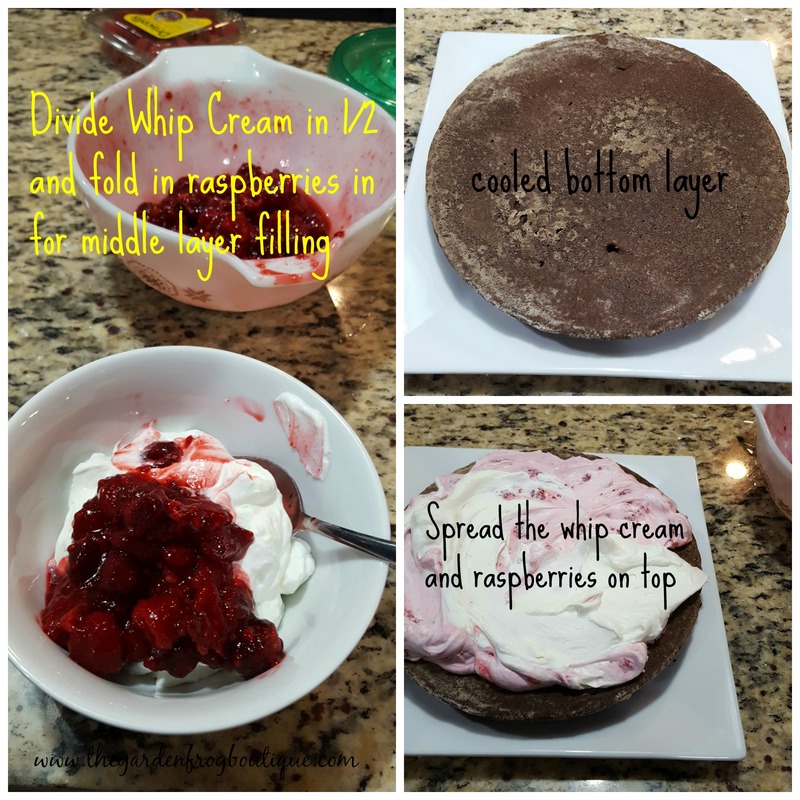 Before you start slapping on the whip cream and raspberries, you need to fold/mix in 1/2 the whip cream with the bowl of thawed raspberries. Spread on the first layer. Then place the 2nd cake on top and spread the remaining whip cream on top. For some color on top, I save a bit of the juice from the frozen raspberry bowl and swirl it on the (white) layer of whip cream before adding the fresh raspberries. I let the whip cream ooze out the sides and not worry about frosting the cakes. The cake sits better after it has been refrigeratored but who can wait that long? Not me so I carefully cut it and serve knowing that the layers will slide off each other and the whip cream will ooze but it is too good to care. You could change this cake recipe up with strawberries or cherries. 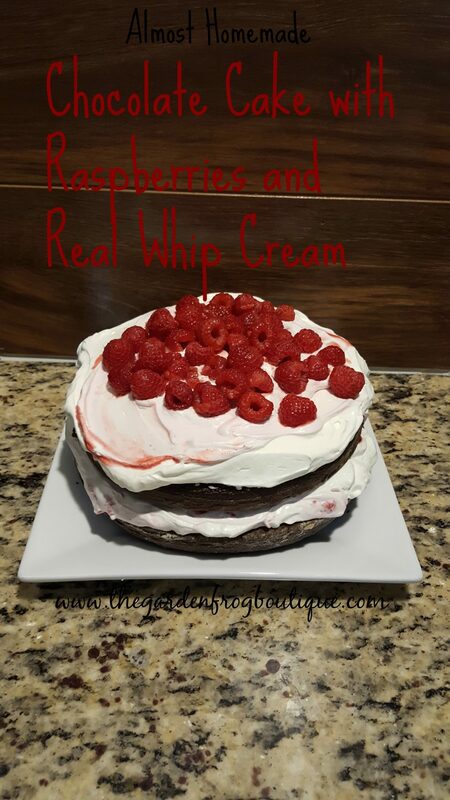 I have made it in a 9×13 pan and spread the whip cream and raspberries on top for a dessert on the go. Thanks for stopping by! 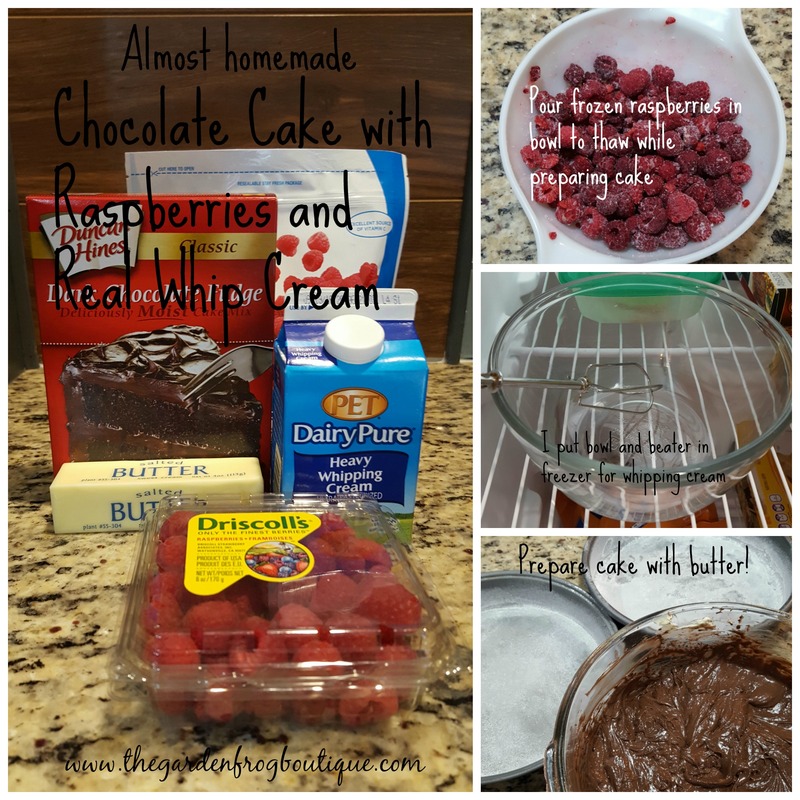 I enjoy simple baking and cooking and I hope to add more recipes. Have a great day and enjoy the dessert. Thank you. I will try this recipe this weekend. My family would love it.